I am considering my little 365 circles, which are now pieced into 9-patches and ready for action. Sewn together they would make a 36" square - not big enough - so now I am looking for things I can add. I have a good selection of shirts that would work. I like the idea of continuing with old shirts, but have found other bits in my stash that might work. Well, I am inclined to agree the Mr., I think. But, I know why! It's that all blue/white row that goes right across. Switch in a big pink square, and I think the eye won't shoot across anymore. I love the two prints in the last photo, especially those squares! But I think the flow will be better if you stick with shirtings, and the plaids will still give plenty of contrast and interest. Those prints would make a lovely starting point for the next project! I would stick with the shirts. I think you will like it better in the end. You should consider a 5x5 design so that those big pink 9 patch blocks can be placed in a way to not detract. Like one as the centre block and the others in the corners, or the middle of the quilt like a plus sign. Just an idea. I agree the placement of the pink squares needs to be rearranged. One in every row or something like Ariane mentioned. As far as the other I think whatever you decide will be wonderful. You'll have fun playing with these ideas. I think the shirts would be good Kaja. I feel the same as Mr Sewslowly. It makes me think of Bridget Riley. 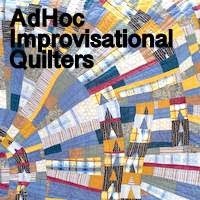 I think the quilting stitches would make a real difference though. You always get it right in the end, so keep playing. What an interesting piece. I love the fabric on the left bottom. But, it may not be right for the quilt. Have fun moving things around and making decisions. That's half the fun of quilting. Your eye does go to the pinks. I agree, get that other one in there on the row without one and then see what happens. I thing the lovely fabrics at the bottom draw to much attention so the circles are no more in the center. Those shirts look promising. You will find a perfect solution. I love the sort of faded look to the whole so far, not faded like in the sun lol but the gentleness of the fabrics and stitching? I too think the shirts are in keeping with that subtlety, they may have worked wonderfully as strips tween squares though not necessarily around every single square, maybe around 2 or 4 set together? But as has been said, you seem to magically transform fabrics by the end into an eye pleasing whole - so I await the magic happening! Wow, congrats on getting all your circles done! That is the definition of persistence. I love the soft, almost low-volume of your backgrounds and I think the shirts/plaids would go better. And I do like the idea of the pink blocks making a plus sign somewhere in the quilt, not necessarily in the middle though. I know you'll have fun playing with this until it makes you happy! This is the most fun part of the design process - moving things around, adding fabrics, taking away fabrics, moving blocks. Have fun with the journey, and it will be a quilt you will love! I love all those little circles!